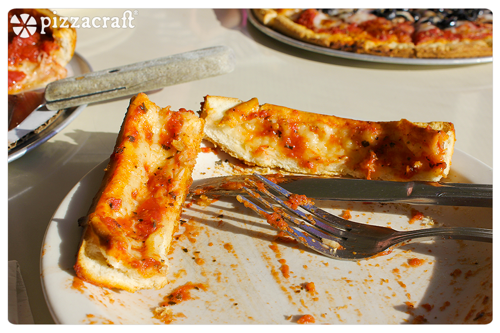 At Pizzacraft, we're all about homemade pizza. With our stones, peels, tools and accessories, you can have a pizzeria right in your own kitchen. But there are always those days you just don't feel like cooking - and sometimes, you want to get out and look for new ideas to take back home and spice up your own creations! So, in the name of all things pizza, a few of us from the Pizzacraft crew went out to Zachary's Chicago Pizza (with locations in Oakland, Berkeley, and San Ramon) for some field research. 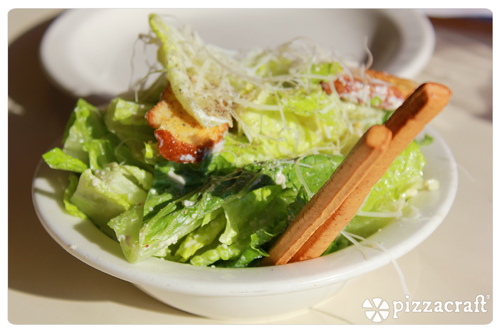 First thing's first: if you order a stuffed crust pizza, you're going to want to order a salad to start. 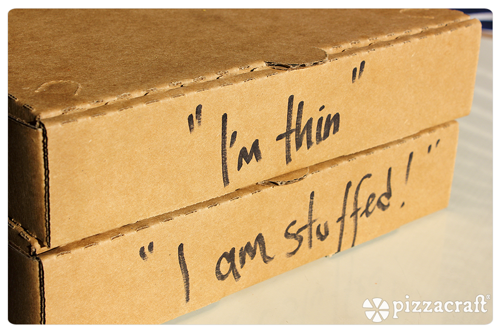 While their thin crust pizzas can take 20-30 minutes to make it to your table, their stuffed crusts can take up to 45 minutes. While it's worth the wait, if you're already hungry, you'll be starving by the time the pie arrives, so take the edge off with one of their small salads. 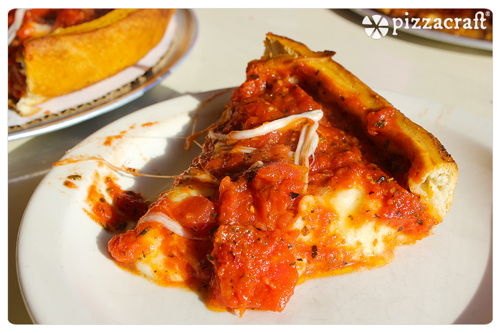 Though Zachary's is famous for their deep-dish stuffed pizza, they have a mean thin crust on the menu as well. 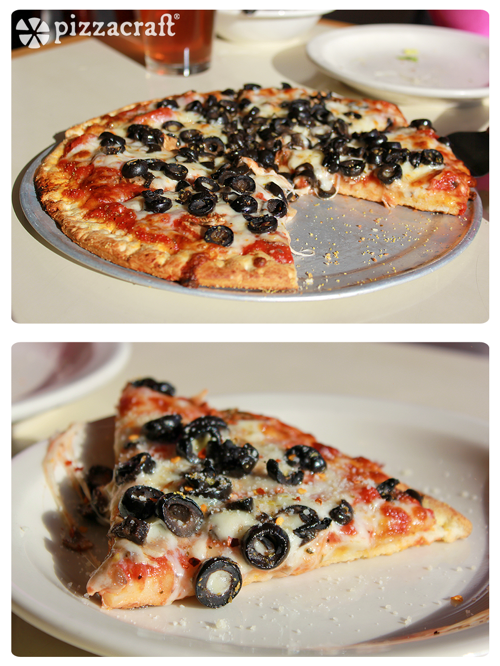 We gave their thin crust pizza with black olives a try. Their thin crust pizza is a pretty good pie, but the texture of the crust was a little too cracker-like for our taste. But then, it was time for the main event! Because I'm a pizza purist, we ordered a stuffed crust with some extra cheese - no extraneous toppings to distract from the essential ingredients. Serving a slice of the stuffed crust requires some technique. They're hefty slices, and bound by a ton of stretchy cheese. You've got to lift with one hand, deposit the slice onto a plate held in the other, and cut the cheese with a sweep of the spatula, scraping it against the side of the plate to sever the cheesy strings. Once we had a few slices served, we could see the cross-section of the pie. The stuffed crust pizza is made with the crust on the bottom (of course), then the cheese and toppings, and then the tomato sauce. The thing I like best about Zachary's pizza is the quality of their ingredients. The crust is buttery and slightly flaky, absorbing some of the flavors from the layers above; the mozzarella cheese is mildly flavored, chewy, and has a hint of olive oil flavor. The tomato sauce has hunks of juicy crushed tomatoes that are perfectly seasoned and bursting with freshness. By the end of the meal, I could have taken that bottom box and used it as a name tag. With their delicious pizza, Zachary's guarantees that you'll leave full - but already planning your next visit. If you're interested in bringing the Zachary's experience home, Pizzacraft offers a few tools to create your own deep-dish pizzas. 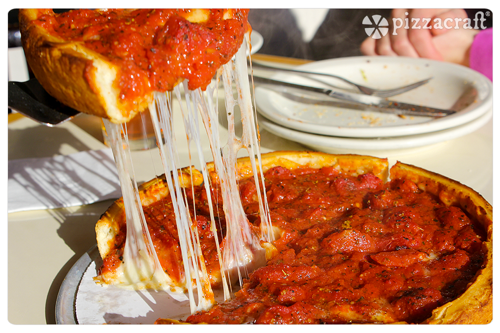 Check out our Round Deep Dish Pan in order to bake your own traditional pizzas. 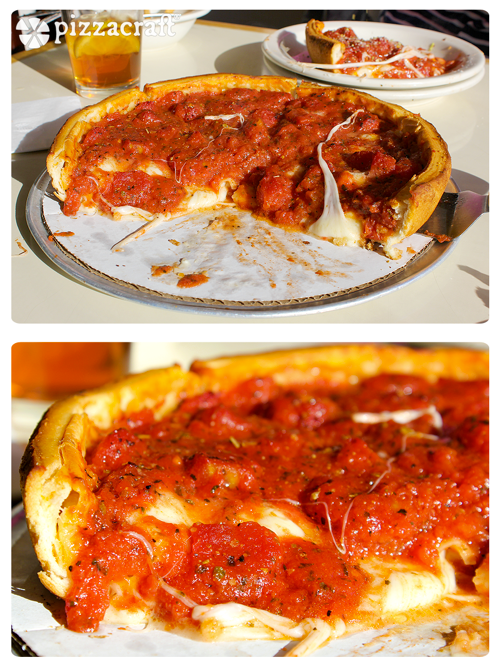 Or, for a new twist on the Chicago tradition, our Upside-Down Pizza Pans will help you easily put together personal-sized deep dish pies loaded with your favorite toppings. Do you have a favorite Bay Area pizzeria for us to try? 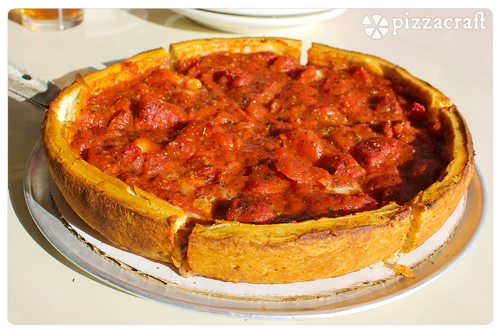 How about a deep dish pizza recipe for us to try out in our kitchen? Leave a comment, hit us up on Facebook or Twitter and let us know!